A brand new class have arrived at New York's High School for Performing Arts. Transported back to the 80's, we join the feisty, fame-hungry students as they embark on their studies. The stage is set on entering the auditorium - a glitzy, flashing 'fame' sign hangs against the contrasting urban school background. We are instantly drawn in. When and what time can you see National Theatre's Shakespeare's As You Like It in South West Wales? Have you seen these strange visitors to Swansea City Centre every Thursday? All-female Shakespeare returns to Wales: "It still feels like a radical thing to be doing"
The production that follows is slick, seamless and of an unwavering professional standard. The hard work that's gone into this show is evident, from the smallest detail in the costume to the colourful, yet unobtrusive lighting. Most of all, it's evident in the work that the cast have put in, shaped masterfully by director, Kathryn Wheel. Ellie Morgan gives a loud, sassy performance as Carmen and delivers soaring, rich vocals that fill the room, while Ben Thomas treats us to his unmistakeable singing style and perfects the art of a subtly as the studious Nick. Andrew Snowdon and Rebecca Weston, as Joe and Mabel respectively, bring cheeky laugh-out-loud moments and show off their keen sense of comedy. As a group, they truly shine - the air feels electric with the energy and enthusiasm from each and every one of the cast members, whether they are a dancer in the background of a big group number, or a principal taking centre stage for their intimate solo. 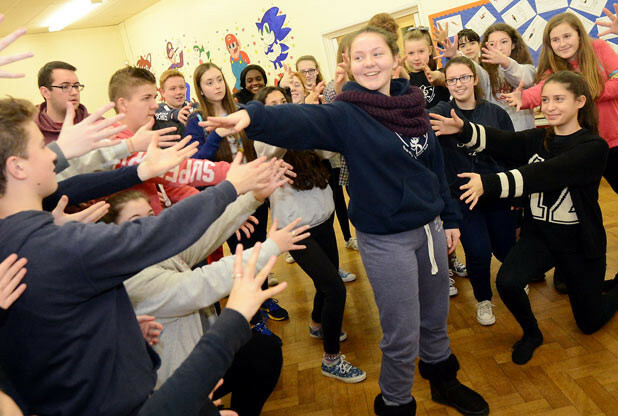 Just like the students at PA, this theatre company is the one to watch for our Swansea stars of the future. "I Want to Make Magic" the students sing. Well, magic was made - the audience were spellbound.